Directions (Qs 1 – 4) : Read the information given below to answer the questions that follow. 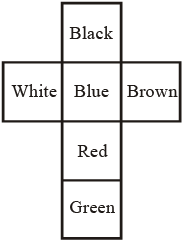 A cube has six sides, each of which has a different colour : black, blue, brown, green, red and white. The red side is opposite the black. The green side is between the red and the black. The blue side is adjacent to the white. The brown side is adjacent to the blue. The red side is the bottom face. The four colours adjacent to green are black, brown, red and white. Which of the following can be deduced from the statements 1, 2 and 6 ? The red side is opposite to the black. Therefore, if red is at the bottom, black will be at the top. Which of the following statements given above adds no information? 6 does not add to the information provided by 1 – 5. If the red side is exchanged for the green side and the blue is swapped for black, then which of the following is false ? Red is opposite to black. White is adjacent to brown. Green is opposite to blue. White is adjacent to blue. Adjacent to white, we have brown. Directions (Qs. 5 – 9) : Following questions are based on the figures given below which represent different positions of the same dice. Which number lies at the bottom face of the dice (i)? Since 1, 3, 5 and 6 are adjacent to 2. Therefore, 4 lies opposite 2 i.e. at the bottom face of dice (i). Which number lies at the bottom face of the dice (iii)? Since 2, 3, 6 and 4 are adjacent to 1. Therefore, 5 lies opposite 1. Hence, 1 lies at the bottom face of dice (iii). Which number lies opposite 6? 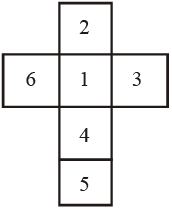 Since 1, 4, 2 and 5 are adjacent to 6. Therefore, 3 lies opposite 6. Which of the following combinations shows the numbers at the adjacent surfaces of the number 4? Hence, 1, 5, 3 and 6 are adjacent to 4. Which of the following numbers does not appear on any one of the adjacent surfaces of the number 3? From the figure in previous solution, 6 is not adjacent to 3. Two positions of a dice are shown, when 4 is at the bottom, what number will be on the top? From the two figures it is clear that the numbers 2, 3, 5 and 6 cannot appear opposite 1. So, 4 appears opposite 1. Therefore, when 4 is at the bottom, 1 will be on the top. What should be the number opposite 3? From the three given figures, it is clear that the 1, 2, 5 and 4 appear adjacent to 3, so none of these can appear opposite 3. Therefore, 6 appears opposite 3. On the basis of two positions of dice, find what number will be on the opposite face of number 5 ? Common number i.e. 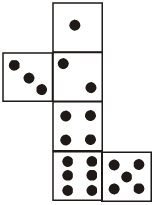 3 to both the dice is placed on the central position of the figure. Now place the numbers in the anti-clock wise direction in block I, II, III and IV respectively. Remaining number i.e. 2 will come in the block V. Hence number 4 is opposite to number 5. Hence, the numbers that are adjacent to 1 are 5, 2, 6 and 3. ∴ 3 will come in place of ‘?’. 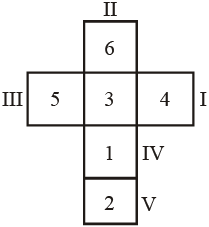 Since 2, 3, 5 and 1 are adjacent to 4. Therefore, 1 will come in place of ‘?’. When the sheet shown in fig. 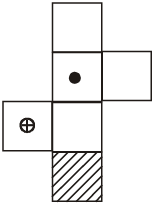 is folded to from a cube, then the face bearing the dot lies opposite to the shaded face, the face bearing a circle (With ‘+’ sign inside it) lies opposite to a blank face and the remaining two blank faces lie opposite to each other. 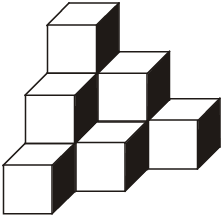 Clearly, the cubes shown in figures (B) and (D) cannot be formed since they have the shaded face adjacent to the face bearing a dot and the cube shown in fig. (C) cannot be formed since it shown all the three blank face adjacent to each other. Hence, only the cube shown in fig. (A) can be formed. When the sheet shown in fig. is folded to form a cube , then ‘F’ appears opposite ‘C’ and ‘A’ appears opposite ‘D’. Therefore, the cube in fig. 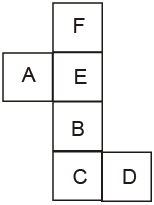 (A) which shows ‘F’ adjacent to ‘B’, the cube in fig. (C) which shows ‘E’ adjacent to ‘C’ and the cube in fig. (D) which shows ‘A’ adjacent to ‘D’ cannot be formed. How many dots are their on the dice face opposite the one with three dots ? From figure (i) (ii) and (iv), we conclude that 6, 4, 1 and 2 dots appear adjacent to 3 dots. Clearly, there will be 5 dots on the face opposite the face with 3 dots. When the following figure is folded form a cube, how many dots would lie opposite the face bearing five dots ? When this figure is folded to form a cube then the face bearing three dots will lie opposite the face bearing five dots. Which number is on the opposite face of 4, if the four different positions of a dice are as shown in the figures given below. From figure (i) (ii) and (iv), we conclude that 6, 5, 2 and 3 appear adjacent to 4. Clearly, 1 will be opposite the face of 4. 3 cubes, 2 columns containing 2 cubes each and 3 columns containing 1 cube each. Therefore, total number of cubes = 3 + 4 + 3 = 10.